We LOVE water beads! 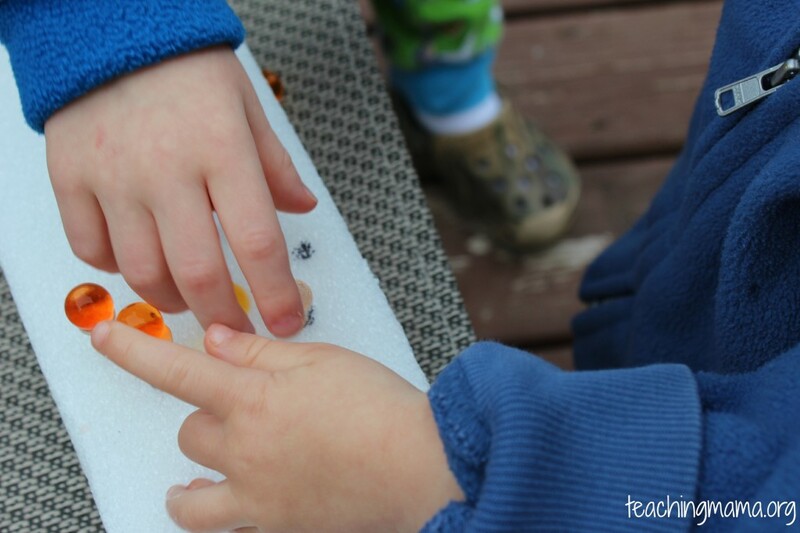 These little hands couldn’t wait to start playing with them! I love the orange/red/yellow color for summer! I found these water beads in a three pack at Walmart for $3. I thought it would be good practice to carefully put water beads on top of golf tees. 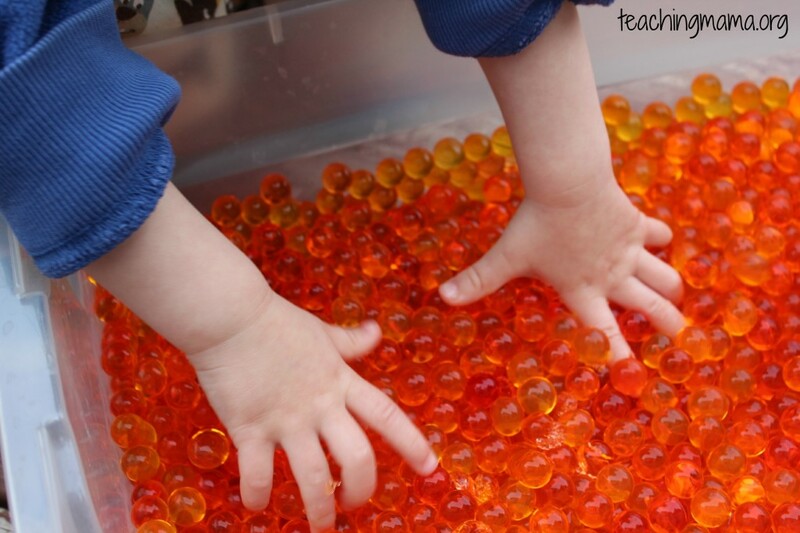 You really have to focus on not knocking the other beads down and try not to drop the squishy water bead! 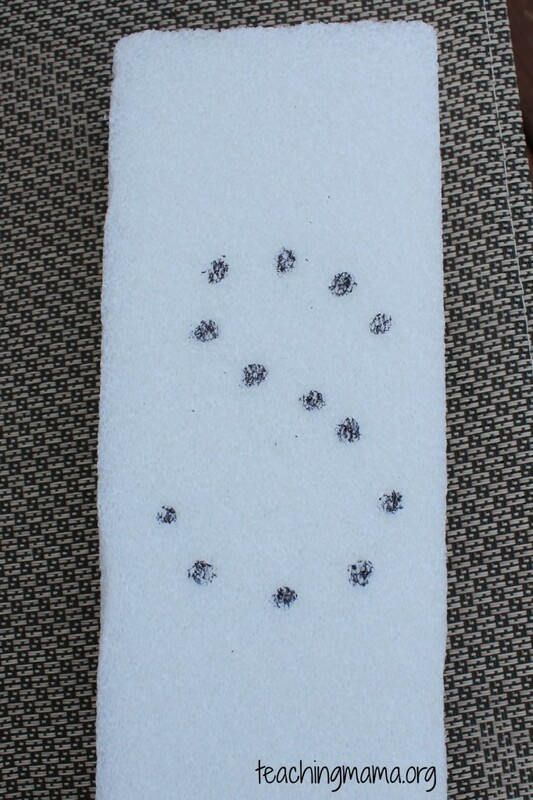 To make this, I took a piece of styrofoam and had my oldest (3.5 years old) stick the golf tees in the styrofoam. At first he stuck them anywhere he wanted. On the backside, I made dots with a Sharpie in the formation of the letter S, since we’re studying this letter. Then I had him poke the golf tees in and we added water beads! 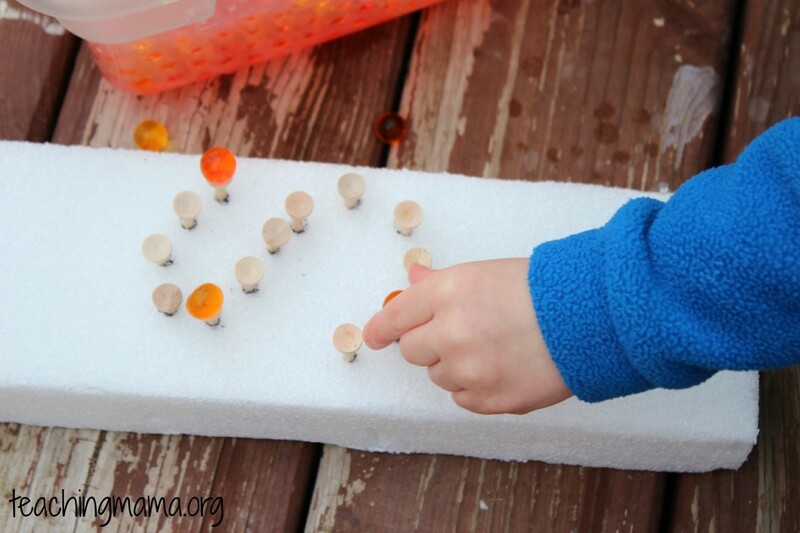 My youngest (20 months) was able to help us put water beads on top. It was definitely a challenge not to knock the other beads over!! It reminded me of dominoes…when we knocked one over, they all fell over. It’s also a great activity for focus and concentration! 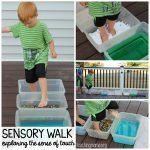 I love this activity and we’ll definitely be doing this again! 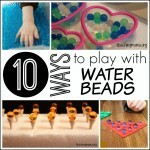 One more thing about water beads is that they last for a very long time! They start out as little seeds and you add a lot of water to them. Once they’ve been out for a while, they will start to shrink up. All you have to do to get them back to size is add water to them. If you want to dry them up and then use them again later, you can do that, too! Fabulous! 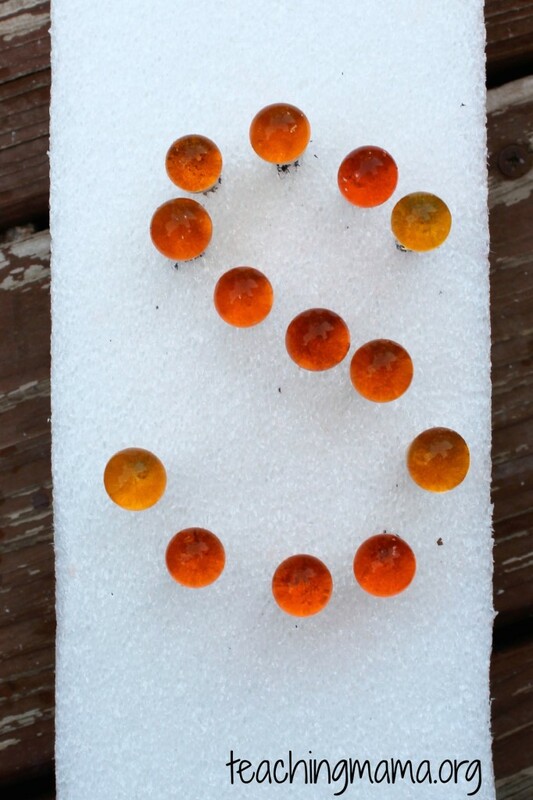 I have GOT to get some water beads – I’m seeing them everywhere! 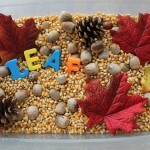 Definitely something we need to try when we work at creating letters. Thanks! Yes, you NEED to get some! Your kids will love them! Hi there! 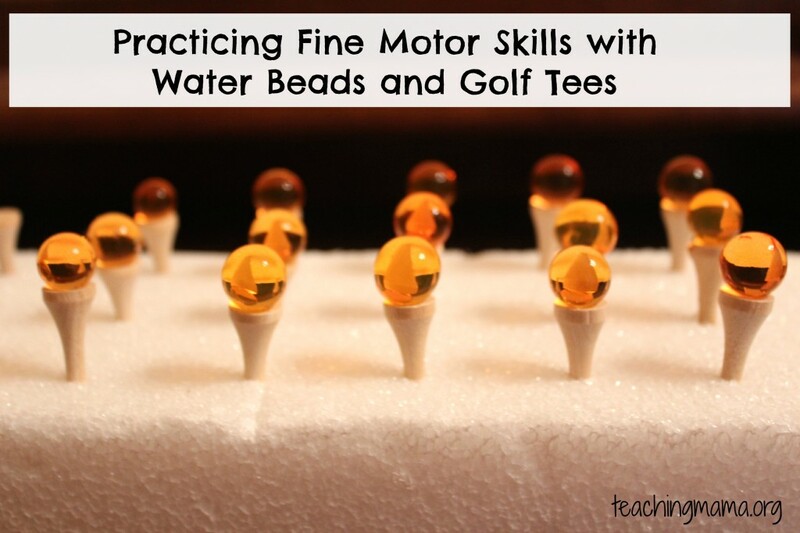 I just shared this water bead golf tee idea on my Facebook blog wall. This idea is fantastic! 🙂 Love water beads! Thank you so much, Deborah! We had a lot of fun with this activity. Have a great day!! 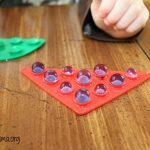 I have seen this activity with marbles but never with water beads. Lovely! Hi Katie! Thank you. It was fun to create and fun for the kids! I’m really excited to try this game with my little dude once he’s old enough to enjoy it (He’s only four months old at the moment)! Thanks for putting together this website. It’s awesome. 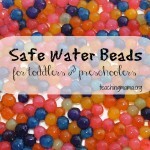 I was worried however as to whether or not the water beads are safe if ingested. They are not. 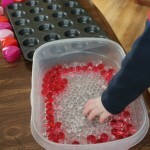 But I did find this post that you or your readers might find helpful for a safe alternative: http://www.blogmemom.com/sensory-activities-edible-water-beads/. Yes, I’ve seen those! I would love to try them out. Thank you for sharing!